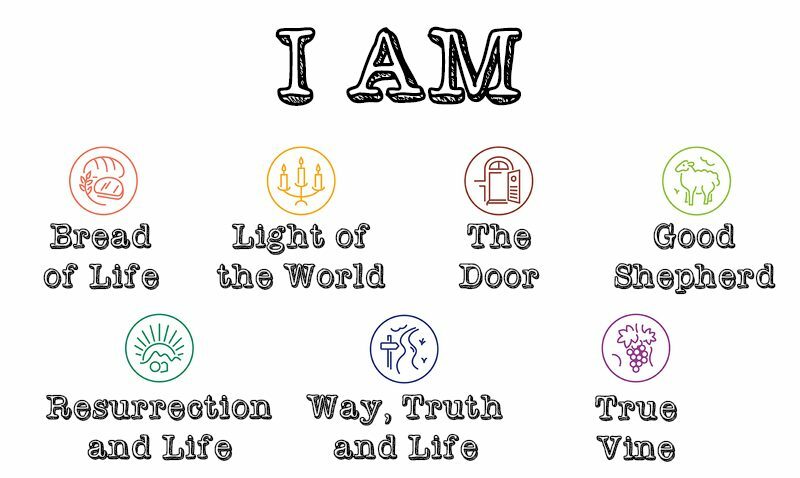 Are you familiar with the I AM statements in the Bible? There are 7 of them (some folks advocate for 8). They all say something different, something unique. So, given their differences, which one is true? Which one do you believe in? This is not a fair question is it? But isn’t this the attitude of many in our society today? Isn’t it interesting that our society likes to set ideas up against one another? We seem to believe God is not capable of creating a world where multiple things that may seem to contradict one another can all be true. This verse is most often used to prop us our Christian faith to the exclusion of people who do not believe in Jesus and people who are seeking, searching or struggling with their beliefs. The word believe here is pistueo – and it means more than cognitive acceptance. It means to trust, to entrust your life to, to follow because you have confidence in, something which you accept so as to live your life differently because of it. That’s a good bit different than simply believing in Jesus. And it is in this sense that we must hear the verse I am the way, truth and life. Jesus embodies the way that we should trust and follow. Jesus embodies the truth that we can trust with our lives, with the way we live. Jesus embodies the kind of life for which we should strive. This is neither exclusive or inclusive. It is just not a teaching that speaks an answer to that question. Despite how Christians have used it over the years. This verse is written to a specific community of Christians to show them that the one whom they say they believe in calls for more than their belief. That Jesus life, death and resurrection are not simply about saying you believe in something. That through Christ, God seeks more from us than an ABC (accept-believe-confess) prayer, that God seeks more than our acceptance our belief and our confession. That God reaches out to us through his son to create a relationship that calls us to live differently. To live lives marked by those actions that Jesus showed us – love, Grace, mercy, compassion, honesty, service, vulnerability, forgiveness. For far too long, the church has weakened and watered down its core message to one of belief. And frankly it’s made us look liked a sleezy used car salesmen. Far too many people have bought our belief only approach to faith and found that not much changed for them – they still had the same struggles and doubts, the same concerns about their lives, the same old same old. They were looking for the amazing Grace we promised, but they found that the John 3:16 belief they bought was breaking down in their lives after a few hundred miles. Another 20% (One-in-five) say they came to dislike or distrust religious institutions or organized religion in general. 18% say they are unsure or undecided. They no longer identify with a particular religion, but they still describe themselves as religious or spiritual, or in some cases “seeking” or uncertain about their beliefs. And about 10% say they are simply no longer practicing their childhood faith, or are too busy to engage in religious rituals. Of those nones who simply say their religion is “nothing in particular,” 37% say that lack of belief is the reason they no longer affiliate with a religion. And of nones who now identify as atheists, 82% say a lack of belief spurred them to leave religion. Now bear in mind they are not talking about the way they live when they say lack of belief. They mean exactly what the Church and society have taught them to mean about belief, that is, that they do not conform to the cognitive beliefs the church says they must have to affiliate with a family of faith. And this saddens me greatly. The church has reduced faith to cognitive assent such that people who have honest, authentic and vulnerable questions, doubts and other struggles with their cognitive thoughts about faith, about God, about Jesus end up leaving the church because they essentially do not fit the mold the church created for them. What if, by contrast, the church were a place where we held one another in the midst of our questions, doubts and struggles in our thinking about God and Jesus? What if we walked the journey with one another, supporting especially those who were unsure of their beliefs, who questioned what they really believed, who were trying to make sense of the beauty and truth of things that are beyond our ability to rationally explain? What if the church was a family that accepted one another because we love one another, that made space for struggles, that welcomed cognitive dissonance? I’ll tell you this, I would sure rather have all those nones as living participants in the life of our family of faith, than see them wander through the world disconnected from the spiritual roots from which they came. I would rather see them here trying to cognitively work out their faith while learning to live out the way of Christ. What would a church look like that created welcoming space for such persons? What would that church say? What would they teach and preach? Unless the church is to simply be a country club of people who think they cognitively have all the answers, then we ought to figure this out. We might just find that in doing so we become evangelists in the truest sense of the word. [following Christ] Is not about believing the right things, about making the right statement of faith before a cloud of witnesses. It’s not about staying out of hell, and it’s not about making sure your sin tab is paid up in case jesus pops in for a surprise inspection. After all, many of Jesus’ own disciples questioned, even doubted, who Jesus was. They had different answers when he asked them who he was. But that didn’t mean he condemned them, threatened them or kicked them out of the group. They were committed to seeking, to following, to learning and growing, and to help him realize something better for their own lives and the lives of others. You know, saying “I believe” is like saying “I do” when you get married. You can say I do all day long. But actually living as a person who loves another person is what being married is all about. Making concrete choices each day to love and show love to another person is what marriage is about. And this is not to say that saying “I do” or “I believe” is not important. Surely it is an important ritual and marker in time and in a relationship. But actually practicing love is what the relationship is about, isn’t it? Jesus said, “I Am the way the truth and the life.” That is, I am not simply a person to believe in. No, I am about a particular way of truth and life. Come and follow me along that way and it will make all the difference. He did not say give your cognitive assent to me and you will have life. Jesus said, no one can come to the father except through Christ. That is, if you want to know God as your parent, if you want to live as a child of God, you can do so through the way, truth and life of Jesus Christ. He did not say, the only way to be a Christian or to go to heaven is by cognitively accepting Jesus. We do know that no [one] can be saved except through Christ; we do not know that only those who know Him can be saved through Him. Folks, the church of today must get over our excessive focus on cognitive belief. We must get beyond belief. We must realize the journey of faith brings us through many different beliefs. I don’t know about you, but my cognitive understanding of Jesus today is quite different than 10 or 20 or 30 years ago. So let’s realize that belief changes – it struggles, it grows, it questions, and it deepens. We must get beyond belief and discover that faith is a walk that takes us up mountains and down into valleys. But always involves walking – that is, doing, acting, learning, practicing, living. For there are a great many people today trying to walk alone ostracized from a family of faith that could be encouraging and supporting them as they walk so that along their walk they might discover the Jesus that they have in truth believed in all along.